Concrete driveways, even with a layer of sealant on them, attract a vast assortment of dirt, debris and staining fluids. Cleaning each spot with a cleanser specifically formulated for the material type can take time and effort. As an alternative, you can quickly remove most materials from the surface of your driveway with a compressed air sandblaster. A sandblaster uses air to fire a steady stream of sand at the driveway. By using sand as an abrasive, you can scrub the offending foreign particles from the concrete, leaving behind a quickly cleaned concrete surface. 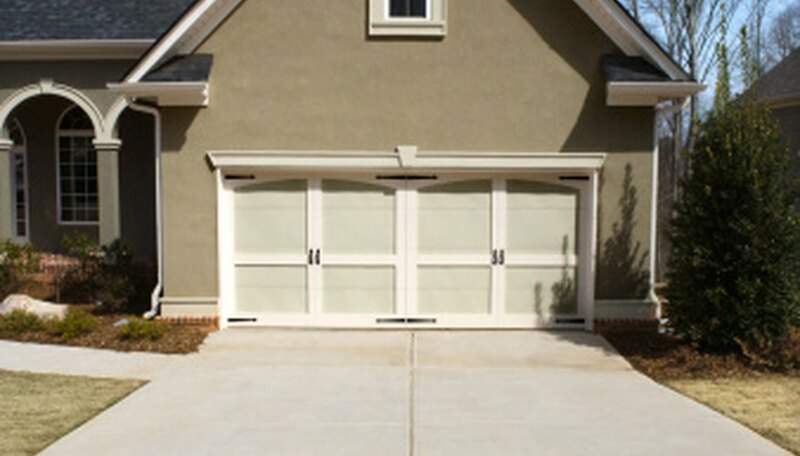 Cover any surfaces adjoining the driveway with plastic sheeting to protect them from flying dirt and sand. Secure the plastic in place with masking tape. Put on a pair of safety goggles, work gloves, and long pants and sleeves to protect your eyes and skin from the sand. Shut off all valves on the sandblaster and compressor. Fill the tank of the sandblaster with silica sand and make certain the tank is securely closed. Turn on the compressor and wait for the pressure to rise to a point between 50 and 80 PSI. Set the compressor to a low setting to prevent the sand from scouring a layer of concrete away as you clean the driveway surface. Hold the wand of the sandblaster about a foot in front of you with the nozzle of the wand directed towards the driveway surface at the head of the driveway. Squeeze the trigger of the sandblaster to start the flow of silica against the concrete surface. Use a back and forth motion with the nozzle of the sandblaster to direct the flow of sand across the driveway. Watch the surface of the driveway as the sand removes any dirt, oil or finish from the concrete. Adjust the air pressure upwards for particularly tough areas, but immediately lower the pressure if damage begins to occur to the concrete, such as light etching. Walk down the length of the driveway and use the sand from the sandblaster to remove any unwanted materials from the surface of the concrete until you reach the driveway base. Release the trigger of the sandblaster and the sweep the area clean using a push broom. Remove the plastic sheeting and masking tape, then dispose of the sand.